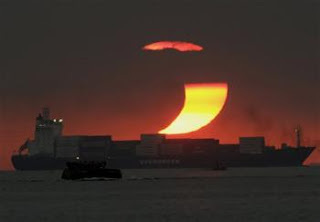 Today, (January 26, 2009) an annular eclipse was visible to observers in Indonesia and South Africa. Most of the eclipse took place over the Indian Ocean, so only the beginning and end of the eclipse were available for land-bound viewers. 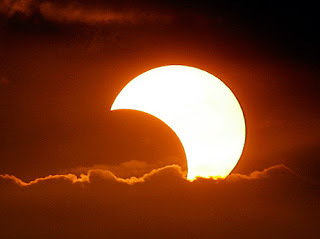 Known as an annular eclipse, this type of eclipse is only a partial eclipse. 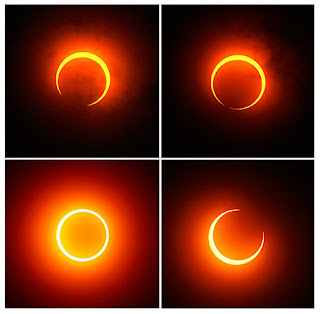 In annular eclipses, the moon appears smaller than the sun, and thus cannot totally cover the sun. Check out the images below to see the effect for yourself.